SEAL is an acronym for SEa, Land, Air. The Navy SEALs are one of the most elite special operations forces in the world. SEALs conduct special operations alone or in small groups and are experts in weapons, tactics, demolition, martial arts and hand-to-hand combat. The first SEAL units were authorized by President Kennedy in 1962, as the Navy’s counterpart to the Army’s Green Berets, but Navy SEALs trace their heritage back to the elite frogmen of World War II, who were called Amphibious Scouts and Raiders and Underwater Demolition Teams (UDT’s). During WW II, the Navy needed personnel to perform reconnaissance on areas where amphibious assaults were planned, so they recruited divers from Naval Construction Battalions (SeaBees) and gave them advanced training in reconnaissance and demolition. The frogmen scouted the beaches and cleared the approaches of mines and obstacles prior to the amphibious landings in Africa and Europe and during the island hopping campaigns in the Pacific theater. During the Korean War, the frogmen attacked railroad bridges and tunnels along the Korean coastline. They also cleared mines and obstacles before the amphibious assault at Inchon. Once the first SEAL teams were created, they were sent to Vietnam as advisors, instructing the South Vietnamese Navy in underwater demolitions and maritime special operations. Later, the US Navy maintained 8 platoons of SEALs that conducted special operations on a continuing basis throughout North and South Vietnam. They patrolled rivers, destroyed obstacles and bunkers, snatched prisoners, and eliminated enemy leaders and political figures. SEAL teams had a kill ratio of 200 to 1 in Vietnam. The enemy feared the SEALs and put a bounty on their heads, calling them "Men with green faces" because of their camouflage makeup. SEAL teams provided beach reconnaissance prior to the invasion of Granada in 1983. During the invasion they assaulted the airfield and then set up radar beacons to guide the aircraft carrying airborne Ranger battalions. They also captured the Radio Free Grenada transmitting station so that the enemy couldn’t use it to rally his forces. SEALs also carried out an assault on the Governor General’s Mansion and rescued Governor General Paul Scoon, who was being held there under house arrest. In the invasion of Panama in 1989, SEAL teams were assigned two missions designed to prevent the escape of the dictator Manuel Noriega; disabling his boat and his Lear jet. The mission to disable his boat went as planned, but the assault on Patilla Airfield to disable Noriega’s Lear jet ran into fierce resistance. Four SEALs were killed and eight were wounded during the mission. During both Iraq wars (1991 and 2003), the SEALs carried out a number of missions, most of which are still classified. It is known that SEALs were involved in the rescue of Navy pilots, mine clearing operations and the capture of ships and oil platforms. In 1994, SEAL teams provided beach reconnaissance for the Marine landing in Somalia during the UN peacekeeping mission and at least one SEAL member participated in the failed attempt to capture the warlord General Mohammed Farrah Adid. Since the terrorist attacks on 9/11/2001, SEAL teams have conducted many covert missions inside Iraq, Afghanistan, and Pakistan in support of our military objectives. During the war in Afghanistan in 2002, SEAL teams discovered an extensive network of tunnels in eastern Afghanistan that contained nearly a million pounds of ammunition and equipment. On May 2, 2011, Osama bin Laden was shot and killed inside a private residential compound in Abbottabad, Pakistan where he had been hiding for at least the previous five years. 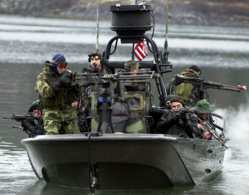 Navy SEAL Team 6 and CIA operatives participated in the joint covert operation ordered by President Barack Obama. SEAL training is conducted at the Naval Amphibious Base, Coronado, California. The six-month basic training course is mentally and physically demanding and is designed to test the individual’s stamina, leadership and ability to work as part of a team. During the 18-week advanced training period, SEALs are instructed in airborne assaults, counter-terrorism, small-unit tactics, long-distance reconnaissance, supply interdiction and raids. Rudy Boesch became famous after his appearance on the first season of television’s Survivor program. He joined the Navy in 1945 and volunteered for the Amphibious Scouts and Raiders. Later he completed UDT (Underwater Demolition Team) training in 1951. In 1962, he was one of the first men selected to join the original SEAL team. Rudy retired from the Navy in 1990, after 45 years of distinguished service. Former professional wrestler, actor and Governor of Minnesota, Jessie "The Body" Ventura served as a Navy SEAL in Vietnam. Former Nebraska Senator Bob Kerrey lead a SEAL team in Vietnam that was nicknamed "Kerrey’s Raiders." He was awarded the Medal of Honor, "For conspicuous gallantry and intrepidity at the risk of his life above and beyond the call of duty." Kerrey led an assault on an enemy headquarters and was severely injured when a grenade landed at his feet. Though bleeding profusely and suffering great pain he led his men in the assault, called in fire support on the radio and directed the evacuation of the prisoners that were captured.